We know you want your wedding to be as unique as the love it celebrates, and so do we.  That’s why Hotel Monteleone offers so many options, covering everything from the hors d’oeuvres at your rehearsal dinner to the ice sculpture at your reception. Hotel Monteleone gives you the choices that make your wedding your own, and the help you need to make them wisely. 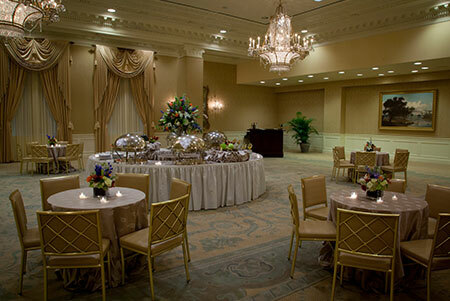 Hotel Monteleone is first choice when it comes to locations for wedding reception venues in New Orleans. Hotel Monteleone is here to help you create the experience of a lifetime. Whether it’s the grandeur of the Queen Anne Ballroom or a rooftop reception in the Riverview Room, we’ll see to it that every detail is handled with as much care and consideration as you’d give it yourself. Our hotel guests often comment on the exceptional detail and quality of our reception ballrooms. 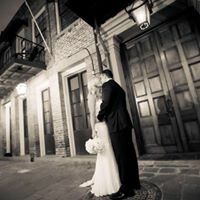 The French Quarter provides the most elegant backdrop for a quintessential New Orleans wedding reception. From a complimentary suite to a customized menu, your wedding will be as perfect as only Hotel Monteleone can make it. Only Hotel Monteleone has the experience, confidence, and facilities to create the event of your dreams. Romance, after all, has always found its home in the French Quarter. “We are locals, and stayed here for our wedding weekend. The staff went above and beyond. They were there to assist us in any and every way. The room was phenomenal! The Hemmingway suite was beautifully decorated, with a parlor and wet bar! Not to mention the private balcony looking over the city!! There was plenty of room for hair and makeup setups for the day of the wedding. Housekeeping came in to do their magic so that our suite was ready for the newlyweds. After the second line, we packed the Carousel Bar…our favorite bar in the French Quarter! We begin by listening to you, learning about your hopes, dreams, and expectations. Then, our dedicated Special Events Manager helps you assemble a package that will make your dream wedding a perfect reality. Best of all, we make sure your wedding happens just as planned. Making your wedding your own is all about options, especially when it comes to the catering menu. From cold and hot hors d’oeuvres to specialty stations and enhancements like ice carvings and international coffees, we bring all the great taste of Hotel Monteleone to your wedding celebration. Our professional experience with Hotel Monteleone is world class and carefully planned. We offer world-class guest rooms at Hotel Monteleone. Each of the hotel’s guestrooms boast high ceilings, crown molding, and traditional decor. Our rooms are non-smoking and pet friendly. All the Traditional Rooms are perfect for the individual traveler and are available with a king bed or two double beds. Many of the Traditional Rooms offer views of the French Quarter or the mighty Mississippi River. Our Preferred Rooms are the largest of our rooms, and are also available with a king bed or two double beds. Most of our Preferred Rooms feature views of the Mississippi River or the French Quarter. If you’re looking for the best hotel rooms New Orleans has to offer, then look no further than the historic Hotel Monteleone. We will make your wedding day everything you dreamed of and more. Contact our Catering Department for rates and more information. Thinking about where to have your rehearsal dinner? We can provide that personal touch along with fresh ideas. It’s our goal to create an unforgettable dinner. 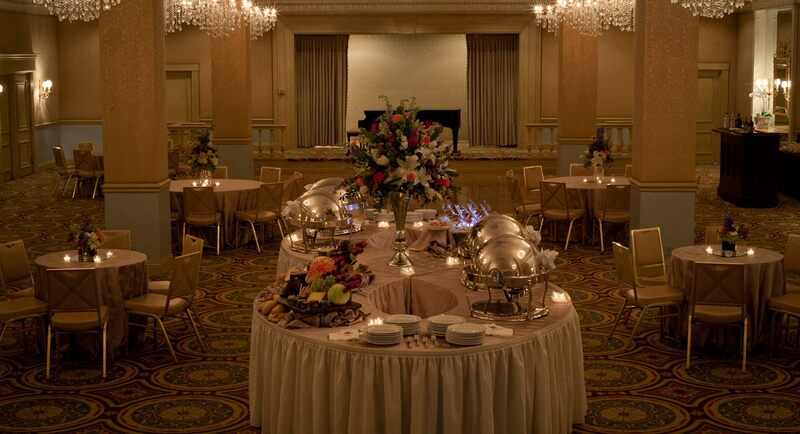 Let our professional staff worry about the details by hosting your rehearsal dinner at Hotel Monteleone, while you take this opportunity to mingle and relax with your family and wedding party before your big day. Tea, wine, and dessert are the best way to celebrate an elegant bridal shower with the Bride-To-Be. Give her that perfect day by letting us add a special touch and provide a bridal tea menu to fit her taste! You’ve dreamed of this day your entire life. From the perfect wedding dress to the breathtaking ceremony. Can you picture yourself exchanging vows in the French Quarter’s most celebrated hotel? Our professional catering staff are here to listen and provide you with ideas and options to make your dream wedding ceremony come to life. We are committed to follow through all the way down the aisle. It’s the morning after your big day and you are now officially married – congrats! What better way to wind down the festivities than with a celebratory brunch? This gives you a moment to thank your family and spend a little more time with everyone before heading off to your honeymoon. 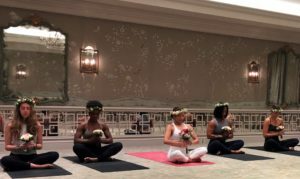 Yoga is the perfect way to relax before your Big Day! Hotel Monteleone wants to make your experience as unique as our Historic Property and create memories for a lifetime. Enjoy (60-75) minutes of relaxation with Vinyasa class. Packages are available for parties of twelve and under. Yoga mats and cold lavender eye towels are provided complimentary. To enhance your experience a floral bridal headpiece may be purchased at $25.00 per person.